General George Churchill Kenney, during his service in the Southwest Pacific in World War II, proved to skeptics the tremendous value of Air Force tactical support of ground and naval forces, demonstrating the new technique of skip bombing, to the pain of the enemy. Kenney was born in Yarmouth, Nova Scotia, in 1889. He attended Massachusetts Institute of Technology intermittently from 1907 to 1911. In June 1917, he enlisted as a flying cadet in the Signal Corps Aviation Section. He was commissioned a first lieutenant in December 1917 and was immediately sent to Advanced Flying Training School in France. Upon successful completion of the course, in February 1918, he was assigned to the 91st Aero Squadron. Kenney flew combat missions for 16 months and was credited with downing two enemy planes. In March 1919, Kenney was promoted to captain and appointed commanding officer of the 91st Aero Squadron. He remained with the occupation forces in Germany after cessation of hostilities until June 1919 when he was sent to the United States and reassigned to the 8th Aero Squadron at McAllen, Texas. In 1926, Kenney was sent to the Air Corps Tactical School at Langley Field, Va., completing the course in the middle of that year. He next attended the Command and General Staff College at Fort Leavenworth, Kan. Following his successful completion of the course at Fort Leavennorth, Kenney served in a variety of assignments. He was an instructor at the Tactical School at Langley Field; he made a survey of possible airdrome locations in Puerto Rico and the Virgin Islands, selecting sites which are in use today; attended the Army War College in Washington, D.C., graduating in 1933. In March of 1935, Kenney was promoted to lieutenant colonel, skipping over the grade of major. Kenney's next assignment was as chief of production at Wright Field, Ohio, in 1939. In March 1940, he was promoted to colonel and sent to Paris as assistant attache for air in France. Kenney observed tactical operations on the Franco-German front and studied technical developments made in military aircraft of both nations. As a result of his observations and recommendations, a number of improvements were made in United States military aircraft over a year prior to our entry into World War II. Kenney was promoted to brigadier general in January 1941 and the following month to major general. He was assigned to the west coast as commanding general of the 4th Air Force, in March 1942 and in July was assigned as commanding general, Allied Air Forces in the Southwest Pacific, and commanding general, Fifth Air Force, joining General Douglas MacArthur as his top air officer. General Kenney was promoted to lieutenant general in October 1942. General George C. Kenney directed the successful air war against the enemy in the Southwest Pacific during the long haul from Australia to the Philippines over a period of more than three years. In one of the classic engagements of the war, the Battle of the Bismarck Sea in early March 1943, Kenney planned and directed the attack of B-17 bombers which sank 16 Japanese vessels in a convoy, with but minor loss to participating U.S. aircraft. He was promoted to full general March 9, 1945. After the war, in December 1945, General Kenney was assigned to the Military Staff Committee of the Joint Chiefs of Staff, and was sent to London for the duration of the United Nations Conference. He continued with the Military Staff after his return to the United States in March 1946. In April 1946, he was designated commanding general of Strategic Air Command, with headquarters at Andrews Air Force Base, Maryland. On October 15, 1948, General Kenney assumed the position of commander, Air University, where he remained until his retirement from the Air Force Aug. 31, 1951. General Kenney has continued to serve military affairs, and the nation, as president of the Air Force Association, in 1954, and as an official with national charities. He also has written several popular books. 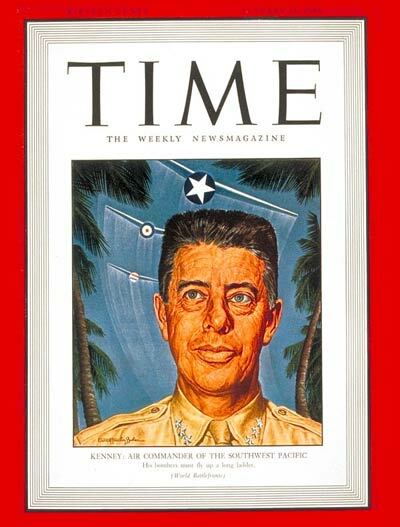 General Kenney died in Miami, Florida, on August 9, 1977. He was buried with full military honors in Section 30 (Grave 398) of Arlington National Cemetery. 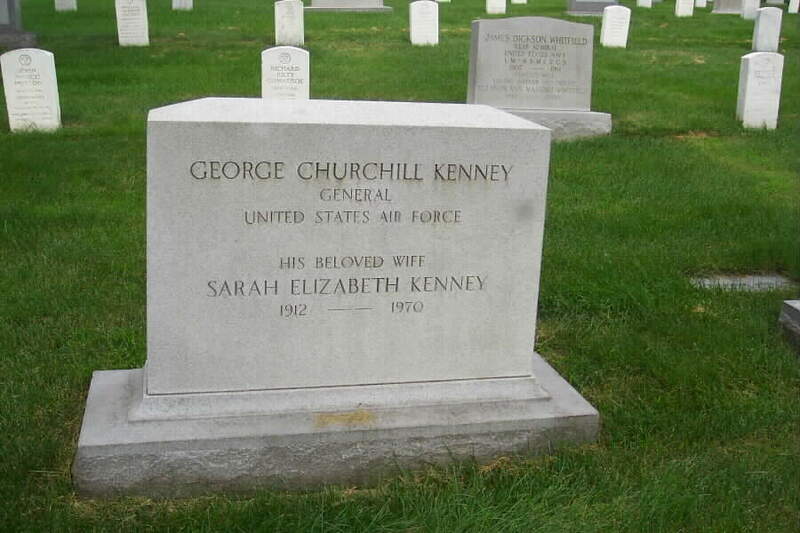 His wife, Sarah Bell Elizabeth Kenney (1912-1970) is buried with him.